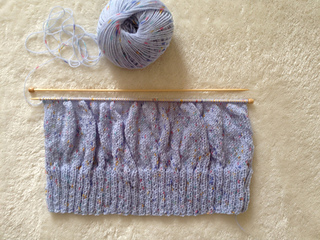 Work with normal needles in size 4.5: CO 120 sts, work 2/2 rib for ~7cm, then continue in stockinette until reaching 15cm. 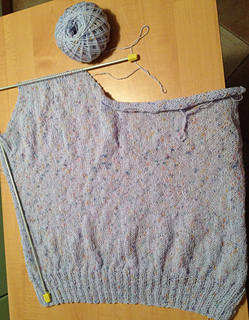 At this point change to needles 3.5 to slightly shape the waist; work until ~30cm in stockinette. 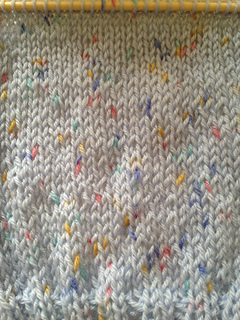 Switch back to needles 4.5 and continue in stockinette. on the RS (right side) cast off 6 sts on each side; cast off one extra st at each RS row for 6 times. cast off the central 5 sts (there should be ~47 sts remaining on each side). Continue casting off 1 on the side for the sleeve for another 4 rows on RS and 1 on the centre (V neck) for another 15 rows on RS. Cast off all remaining sts and proceed with the half side left on hold. Proceed similarly to the front, except leave out the neck shaping. Sew up front and back with invisible seams (mattress stitch), with circular needles 4mm/40cm pick up sts along sleeves and neck and create a 2/2 rib edge. V-neck with central decrease and hemming (=double fabric, if not too bulky) in 2/2 rib. Edit: decided against the double fabric because the rib would be too bulky once doubled. Made single 2/2 rib and bound off fairly tightly to avoid a loose neck edge. As a reference, I found useful info about the implementation of some sweater details in: The Knitter’s Book of Sweater Patterns by Ann Budd.